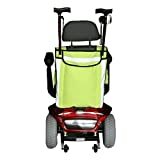 Stay mobile and better supported with high-quality crutches with improved ergonomic foam grips. Do you have a leg, ankle or knee injury keeping you from being mobile or putting any pressure on your joints or ligaments? 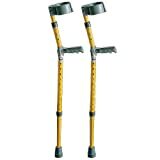 When you don't have the option of slowing down and taking a break, and still need to stay on the go, then you need Soles Walking Crutches designed for all-day comfort, better stability, and long-term durable support. 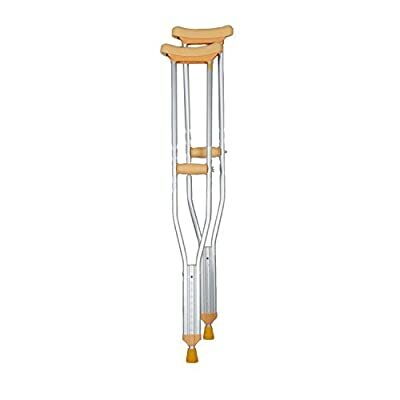 Designed with lightweight aluminum, our walking crutches for men, women and teens will ensure you can move, stand or walk without further straining or injuring your leg. 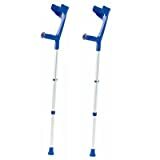 Click 'Add to Cart' above to get walking crutches perfect for keeping you stable and better supported while moving; Soles Walking Crutches! 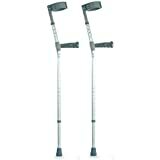 Increased Stability - Thanks to soft armpit foam padding, our walking crutches offer more weight comfort for improved balance and reliability. Foam, Ergonomic Grips - Built to better support your hands and wrists, our crutches come with breathable hand wraps for improved relief. 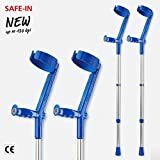 Adjustable Sizing - Soles crutches come in three easily adjustable sizes (Small, Medium and Large) to fit men, women and teens with better comfort. 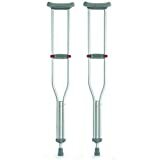 Enhanced Durability - Crafted with premium-grade aluminum, these thick eloxal-covered crutches for injuries or post-surgery offer more resilient support. Satisfaction Guaranteed - Soles product are always backed by superior quality materials, reliable customer service, and a 30-day money back guarantee.